This night I did an evening mountain bike ride on the Virginia Creeper Trail. The sky was clear and the air was cold. Crossing the railroad tracks on Pecan Street, a gigantic November moon appeared to rise directly over the tracks. By the time I got home and got my camera, the moon had moved slightly and was not quite as dramatic, but still impressive. In the photo above, Jupiter appears as the largest star in the sky and is to the right over the moon. 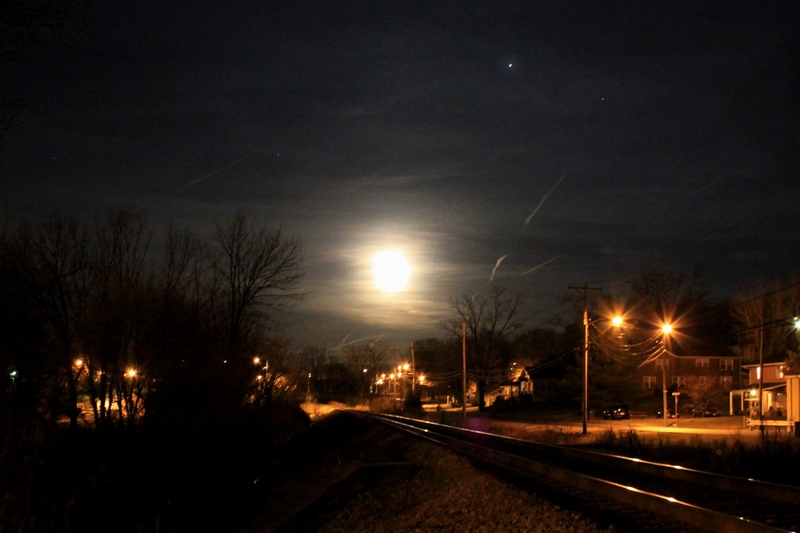 Airline contrails reflect the moonlight in both the foreground and background on a northeastern axis, while railroad tracks glisten from the street lamps in town on a northeastern axis. The scene is reminiscent of The Polar Express, in which children take the train through the night to the North Pole. An almost full moon rises above Holston Mountain on Tuesday, June 14, 2011.